Today we recall two stalwarts of village and museum – Tom and Peggy Gye. This photo needs little in the way of explanation. It is clear we have two young people with hearts beating as one. Tom is in uniform so this dates to World War Two. When Peggy died, back in 2010, it was just short of the couple’s 70th wedding anniversary. In the meantime she had been a real village person with many roles including that of founder and curator of Market Lavington Museum. Tom was a builder and carpenter and much involved with the church including as a bell ringer. Both are much missed, but their legacies continue. 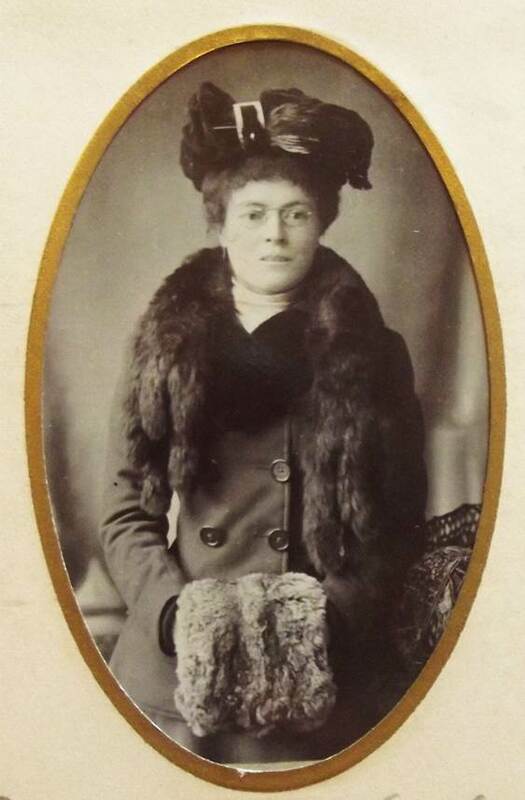 Betty, or Elizabeth, was the wife of a Market Lavington baker, Walter James. This is a good point to remind readers of our Museum Miscellany on 4th October in Market Lavington Community Hall. We always have interval food made from our museum recipes and this might include some Walter James recipes. But back to Betty who was a James by marriage but who was born a Gye in 1869 in Market Lavington. She was the daughter of James and Mary Ann. James was a carpenter and wheelwright and his descendants followed him into that line of work, setting up the yard on White Street. In 1904 Elizabeth married Walter James who was establishing himself as a baker in the village. He had taken over the bakery at number one High Street which is now the Post Office. 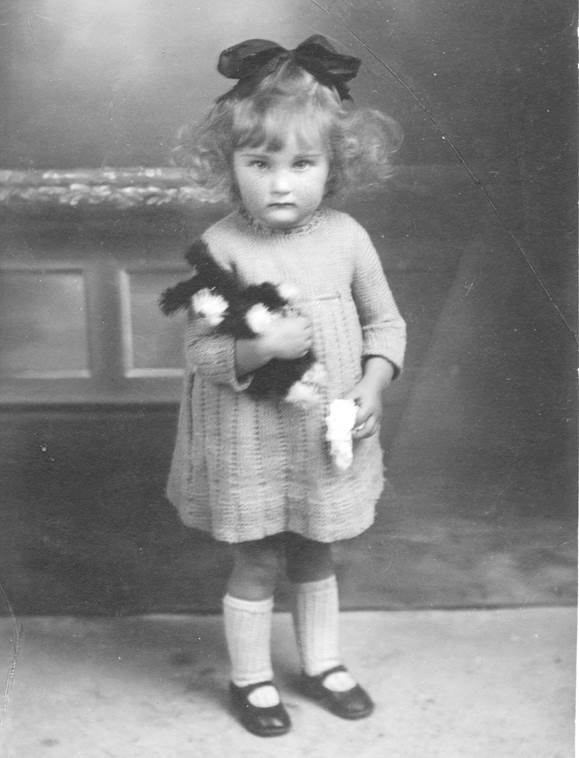 This picture of Elizabeth is in an album that belonged to a member of the Gye family which we have in Market Lavington Museum. The photo has a caption which would have been added later. In 1901 Elizabeth was at home and had work as a dressmaker. By 1911 the James family – young Walter had been born, were in their High Street premises which stayed in the family until well after World War II. But Elizabeth (Betty) James died in 1927. Time was when you needed a licence for many things. Keeping a dog was one of them, and some might say that would still be a good thing. In fact, if you happen to live in Northern Ireland then you still have to have a dog licence but for the bulk of the United Kingdom dog licensing for all ended in 1987. Realising that this was something passing into history, the Gyes passed their final dog licence to the museum. 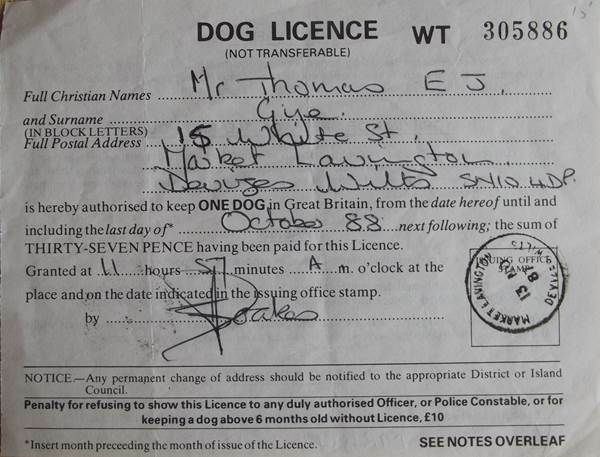 We can see that Tom had to get this licence in November 1987 and it was valid until the end of October 1988. Well it would have been had dog licences been needed into 1988. The cost of the licence seems a very odd figure. It was 37p. Before 1984 it had been 37½p but the ½p was withdrawn that year. The price of the licence had remained unchanged since before Britain had a decimal currency. It had been 7/6 in old money and that seemed a sensible and simple sum back then, being three half-crown coins. And that became precisely 37½p when the country adopted its decimal currency in 1971. We are reminded, too, of previous owners and runners of the Post Office for the licence is signed by either Pat or John Noakes. There’s some ex residents we can all send good wishes to. And what foresight of the Gyes to save this little item for posterity. Well that wouldn’t be the situation with our long case, for it is in miniature and it stands about 25 cm tall. Well, we have put it on the floor there, but you can see, from the skirting board behind it, that it is just a small piece. The carpentry was done by Tom Gye, well known carpenter and builder of Market Lavington. Tom was about 14 when he made this which dates it to around 1934.. 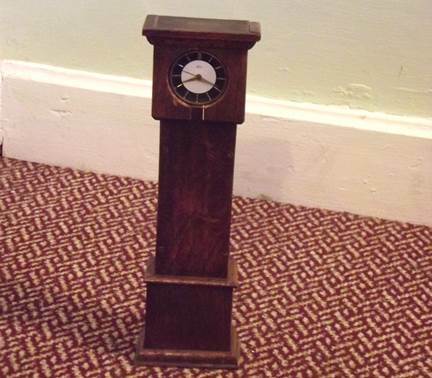 The clock mechanism, which is in working order, is a small alarm clock, removed from another case. This is another recent gift to the museum and you can see it on display in the upstairs room. We all should be delighted with the Gyes who managed to hang on to some items which can’t actually have been that useful to them. Take this double page of adverts they had removed from a magazine. 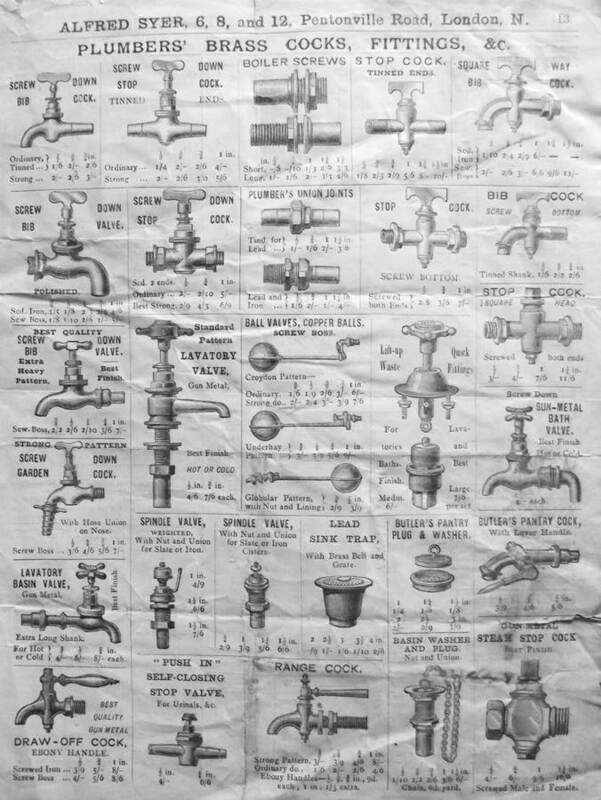 As general builders they may have been interested in taps and valves although we are not aware that they ever did plumbing. This page is believed to date from the early 20th century. The business of Alfred Syer, the advertiser here actually ran from the 1850s until the 1960s. Surely the Gye’s had very limited use for the items advertised on the other side. Now Market Lavington once had at least seven pubs, but surely there wasn’t a need to keep adverts for beer engines and bar fittings, was there? But three cheers for the Gyes for this fascinating page still exists. We rather like the common pewter pot down at the bottom of the page. The 1 pint size sold for 21 shillings for a dozen. That’s slightly less than 9p for a one pint pewter pot. 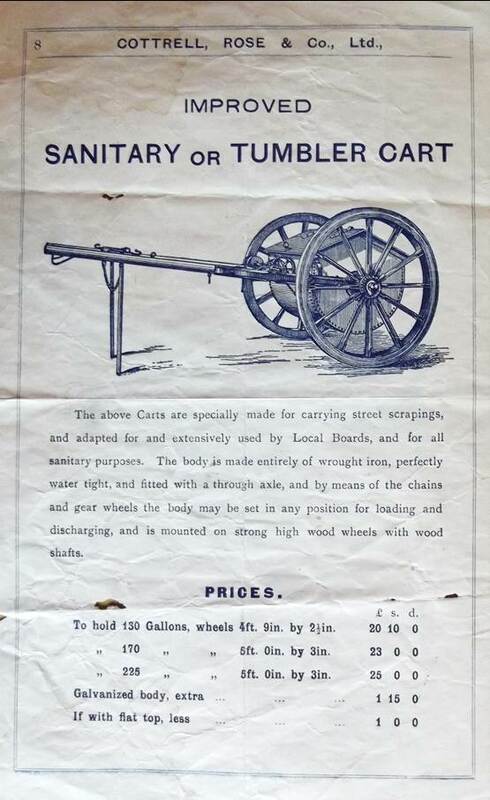 This is another fascinating piece of ephemera which can be found at Market Lavington Museum. At Gye’s the builders they kept everything. When, eventually, the firm ceased trading some things which seem like oddities today came to the museum. 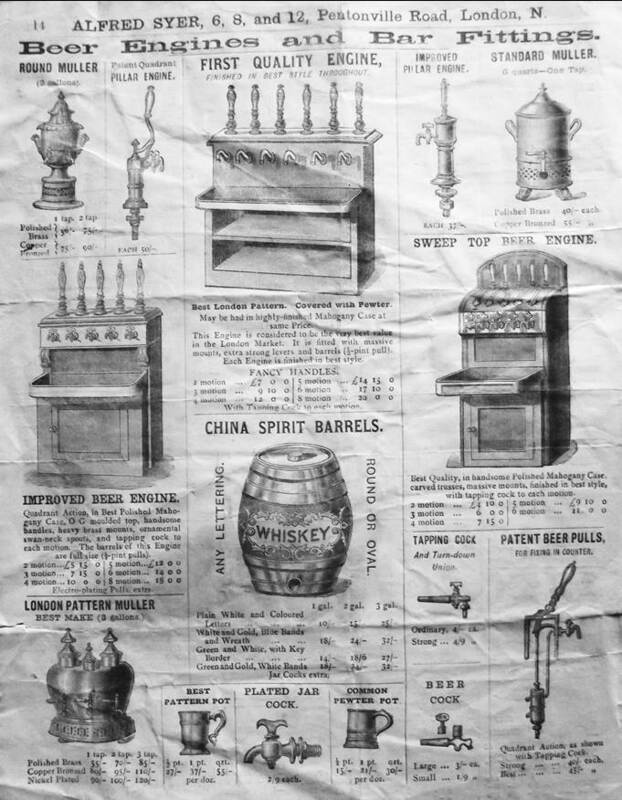 These were adverts that had been kept, more than 100 years ago now, just in case. This one takes the form of a four page leaflet. It was once part of a larger brochure. 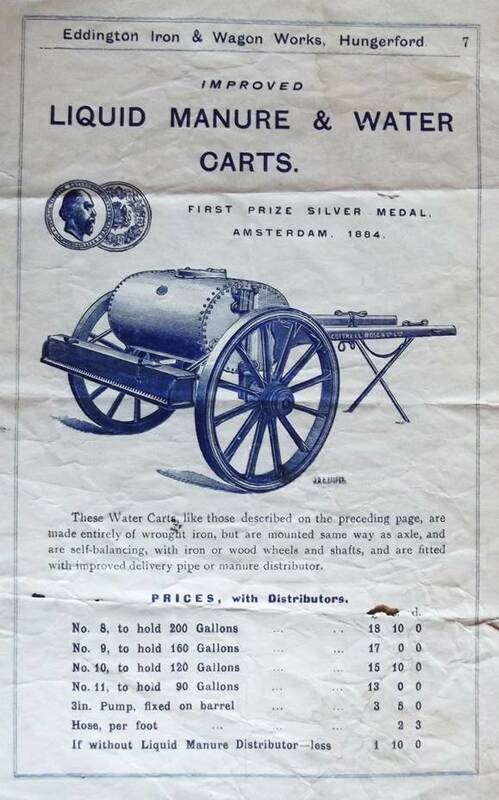 So here we have an ad for a liquid manure or water cart – one which won a first prize silver medal at Amsterdam in 1884 and offered to you by Eddington Iron and Wagon Works of Hungerford. Next we have a crank axle spring float. 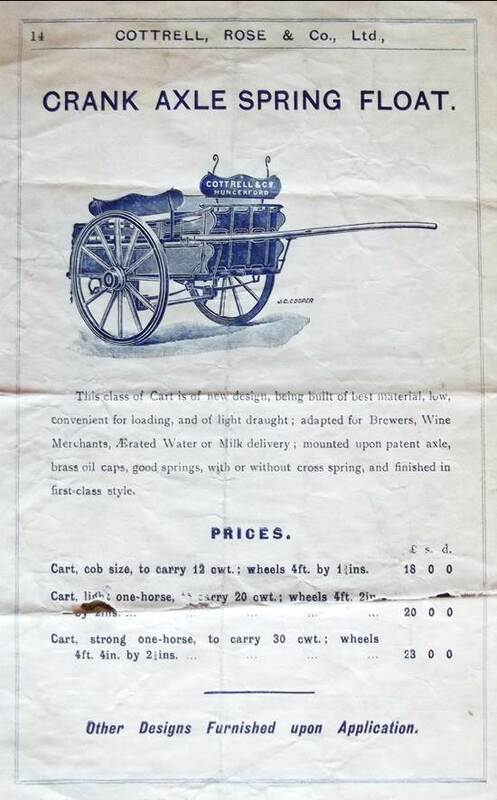 Cottrell Rose and Co was the name of the company at the Eddington Iron Works in Hungerford. They offered a special cart for street scrapings. 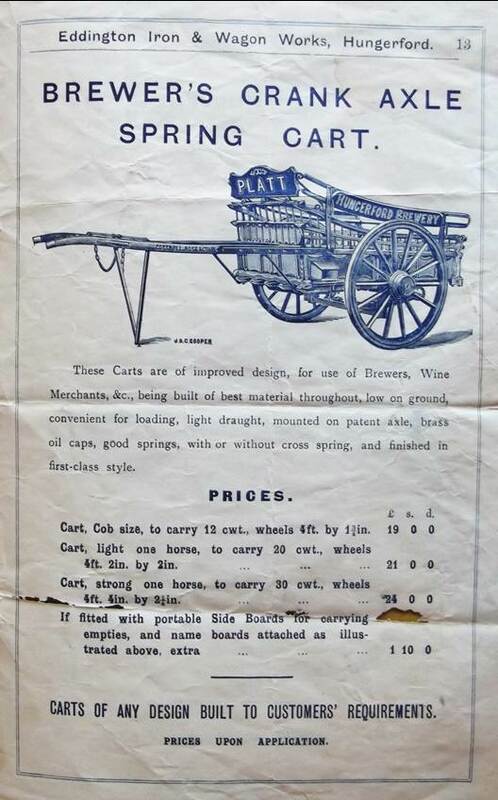 We’ll finish with the brewer’s cart. This, perhaps, is the point to mention that Hungerford has a fantastic Virtual Museum at http://www.hungerfordvirtualmuseum.co.uk/ . It is from this site that we can date our pages to 1897 for they show similar pages with that date.